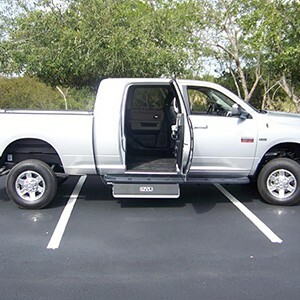 Ryno Mobility offers a wide range of Wheelchair Accessible trucks, offering conversions for Chevy, GMC, Dodge, and even Ford! Many of the Ryno Mobility conversions allow for the customer to decide if they would prefer a driver or a passenger application. As well as allow the customer to use a 2WD or a 4WD platform. If you would like to learn more, please contact your closest Ryno Mobility Dealer to speak with a knowledgeable mobility consultant about conversion options and availability. This conversion is available for either a driver or passenger, and on both 2WD and 4WD chassis. With your choice of a 1500, 2500, or even a 3500 dually! The Ryno RSL-100 interior lift is designed to reflect your personality and independence. The full lowered floor conversion is available on 2WD gas while a center cut lowered floor with a driver transfer seat is available on 4WD gas and diesel Ram Mega Cabs. Plenty of options to fit your lifestyle! Available for either a driver or passenger and on both 2WD and 4WD chassis. With your choice of trim packages, seating for five able bodied passengers, plus a wheelchair, Ryno Mobility continues to provide the most unique conversions for clients around the world. Ryno Mobility has once again pushed the envelope of custom mobility vehicles. They Ryno RSL-100 Interior lift for the F-150 is designed to reflect your personality and independence. Dodge Ram Mega Cab Conversion The full lowered floor conversion is available on 2WD gas while a center cut lowered floor with a driver transfer seat is available on 4WD gas and diesel Ram Mega Cabs. Plenty of options to fit your lifestyle! Ford F-150 Ryno Mobility has once again pushed the envelope of custom mobility vehicles. They Ryno RSL-100 Interior lift for the F-150 is designed to reflect your personality and independence.